On July 14th, 2009, Stan Bowman was named the ninth General Manager in Chicago Blackhawks history. Nearly four years has passed since his inauguration into the GM position and he has made 21 trades to his name, along with two waiver claims and has signed just over 60 contracts. Today we’ll dive into his trade history and pull out his top five trades during his tenure in Chicago. While Kim Johnsson didn’t quite work out as expected due to lingering concussion problems, the Chicago Blackhawks still had enough depth on defense and went on to win the Stanley Cup in 2010 without Johnsson. That eased the bad taste of losing Cam Barker. You might laugh now, but at the time Barker was touted to become a rare mix of toughness and offense from the blue line after he was drafted 3rd overall in 2003; also coming off a season which he scored 40 points in 68 games in 2008-2009. Since the trade, Barker has played for two different NHL teams, appeared in 96 games, scored four goals, and added 10 assists over a span of three seasons. After the lockout ended, he signed with the Vancouver Canucks and has yet to appear in a game, if he does that would be his third team in as many seasons. Now everyone understands why Stan Bowman decided to ship away Cam Barker for broken goods in Kim Johnsson and what was essentially a good prospect, but not a sure thing, in Nick Leddy. The real prize of the entire trade turned out to be Leddy, who is carving out a solid foundation for his career with his puck moving ability, offensive vision, and blazing speed. Of course, this was the perfect blend that Bowman was looking for and fit right into the Blackhawks defense after Brian Campbell departed Chicago to join the Florida Panthers. Since joining the NHL in 2010-2011, Leddy has appeared in 128 games, scoring 7 goals and adding 36 assists during that time. 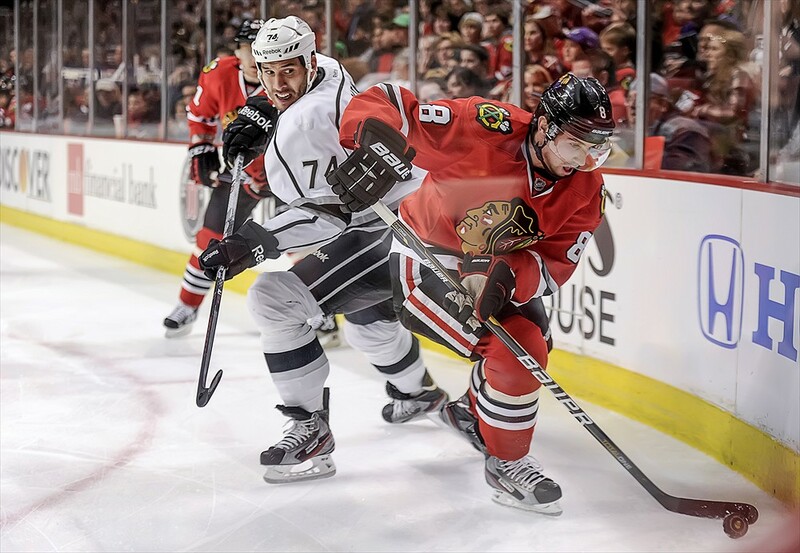 This season he has appeared in nine games and has contributed greatly to the Blackhawks 9-0-2 record thus far, scoring an overtime winning goal and adding four assists to his stat line. His potential is far from maxed out and the Blackhawks could see a breakout campaign from Leddy very soon, perhaps even as early as this season. For all intents and purposes this was a good trade by Stan Bowman. The Blackhawks were going through a cap crunch and he unloaded Kris Versteeg, who had a $3,083,33 cap hit, for a cheaper alternative in Viktor Stalberg ($850,000). None of the other players in this deal have amounted to anything at the NHL level, so let’s stick with the two focal points of this deal. Versteeg was coming off two pretty good years back-to-back where he posted 53 and 44 points respectively and he was also a key piece in winning the Stanley Cup in 2010. It’s hard to say the Blackhawks could have won out on this deal considering the return was for two underachieving prospects and an unproven player in Viktor Stalberg, but the experiment has paid dividends compared to the other disasters that came out of the cap crisis of 2010. Since the trade, Versteeg has played for three different teams and eventually found his way back to Dale Tallon on the Florida Panthers. During that time he compiled 100 points in 151 games. Not bad. Also consider the fact that he is a top line player now that sees a lot more minutes in offensive situations which gives him more potential for production. These are hardly opportunities that he would have received in Chicago with the logjam of top forwards unless he was willing to play center or left wing, and at his price tag it was impossible to justify paying a 3rd line right winger that type of dough. 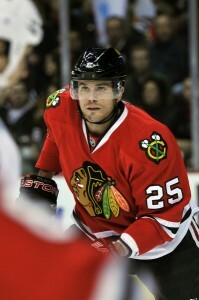 Lets face it, Viktor Stalberg took a while to develop but he can be considered a late-bloomer. His first year in Chicago he only contributed 24 points in 77 games, but it was clear he was still developing, and didn’t receive much ice time as a result. The following year he had a breakout season and he scored 22 goals and 43 points in 79 games, all while remaining a plus player in Chicago during two seasons which the Blackhawks had a lot of highs and lows defensively. That’s not particularly impressive, in a sense, but it’s also encouraging to see out of a young player on the rise. If you look closely, his development pattern follows a line akin to the way Detroit handles their players, such as Valtteri Filppula and Johan Franzen, and I’ll take that. What seemed like a deal that had the least potential to impact the Blackhawks ended up providing Chicago with a player that has become a cheap, productive asset in the Blackhawks line-up that can be slotted on all four lines. His speed is unmatched and although his head hasn’t quite caught up yet, there is still untapped potential for him to become a special player. Versteeg has probably maxed out his skills in that respect. For the rest of their careers, Stalberg might be able to produce just as much offense as Versteeg does, only with less ice time and less opportunities to be in an offensive role, barring the occasional stint with the big four (Toews, Kane, Hossa, Sharp). So far this season, Stalberg has scored three goals and has six points in 11 games on the third line with very little power play time, while Versteeg has potted one goal and has three points in five games (not to mention, he is a minus-5) on the first line with power play opportunities. Considering the cap relief, versatility, and production Chicago has received out of Stalberg, it’s safe to say Bowman got the best bang for his buck. Another trade where only two players will end up being the focal point of the entire deal, and that’s Michael Frolik and Jack Skille. I can’t imagine any scenario where the Blackhawks would actually take back Skille, even if it was for free, so the fact that they made use of him by acquiring Frolik in a trade is pretty well-maneuvered. Alexander Salak also looked like he could have potential in this deal, but unfortunately never panned out. The only complaint about a deal like this is the fact that Frolik does come with a contract that is larger than his production total calls for, but we can look past that. When Frolik came to Chicago, he was actually coming off back-to-back 20 goal seasons (while Skille has not even scored 20 goals in his entire career) and looked like a fairly promising young player. But, Chicago quickly learned that his production was a matter of circumstance, and since arriving in Chicago he hasn’t even scored 10 goals over 102 games, let alone 20 in one year. Michael Frolik has seen his production dwindle just as fast as he dropped down the Blackhawks line-up, from the top two lines all the way down to the 4th line, and even scratched at times last season. But don’t let his decline fool you into thinking he has no value. His defensive game is by far his greatest strength, he provides energy and solid fore-checking effort every shift, draws penalties, can contribute at key times, and his success on the penalty kill provides the Blackhawks with far more value than anything that Jack Skille could bring to the team. Neither player can score often, but if you’re talking about who the better role player is, you would have to pick Frolik for his timely contributions and overall two-way game. Tip of the hat to Stan Bowman for recognizing that. The only reason this trade doesn’t rank higher is because the 2013 draft hasn’t taken place yet, so this could end up being a disaster or a blessing. For the time being, this has been a good trade in sacrifice of the future so we’ll pull it out of the “wait and see” pile to give him kudos. So far Johnny Oduya has provided the Blackhawks will solid play in the top four of a defense that features Duncan Keith, Brent Seabrook, Niklas Hjalmarsson, Nick Leddy, and Michal Rozsival. All defenseman that are capable of eating up minutes. Oduya is third in ice time on the team this season and fifth in ice time since joining the Blackhawks. He fit in immediately upon joining the team at the deadline last year. He ended up with five points in 18 games along with a plus-3 rating, then continued to roll in the playoffs by adding three assists in six games. At times, he has been over-matched physically but it looks like this year they are trying to stick him with a rejuvenated Niklas Hjalmarsson (rather than Nick Leddy) to compensate for that. So far it’s worked magically, not so much for their offensive production, but they have been a stellar shut down combination and Oduya has built a sparkling plus-9 rating over 11 games, also adding three assists. He is a major contributor to the Blackhawks top ranked penalty kill with 24 blocked shots, and is helping Chicago keep their goals against average among the top five in the league. And how can we forget the bargain price that the Blackhawks receive with Oduya, while watching Matt Carle and Ryan Suter signing lucrative deals over the summer? You can point out the fact that there is a difference in talent level, but is it really a difference of $2-4 million? Probably not, and certainly not for the Blackhawks needs. Call this one a pending success until we can get a better idea of who the draft picks are, but at the moment Stan Bowman is winning this one. It’s hard to rate a trade based on draft picks so once again these are usually placed in the “wait and see” pile, but this one has already had an impact on the Blackhawks and could end up being his best deal. With all due respect to Jared Knight, who is an outstanding prospect in his own right, Brandon Saad has the potential to be a game changing power forward and he’s getting an opportunity with the Blackhawks this season. 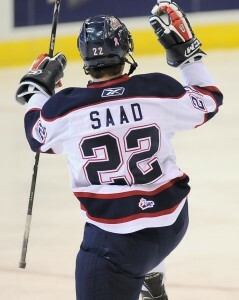 In the OHL, Saad tore up league in 2011-2012 by posting 76 points in 44 games as a 19 year-old. He was so impressive that the Blackhawks called him up during their playoff run against the Phoenix Coyotes where he dressed in two games and added one assist. 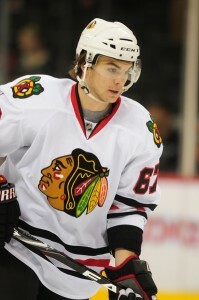 During the lockout Saad skated in the AHL for the Rockford IceHogs where he had a slow start with 20 points in 31 games, but really turned on his game right before he was officially called up by the Blackhawks and made the team out of camp. 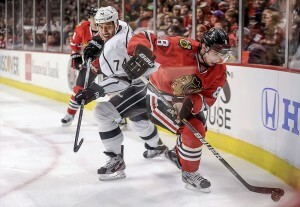 This season in the NHL, Saad has appeared in 10 games skating on the top line with Jonathan Toews and Marian Hossa. Although he has only scored one goal, he has definitely made an impact and it’s clearly only a matter of time before he starts producing on the score sheet. It’s impossible for Bowman to have had Saad in mind when he made this trade one year prior to the draft, so he clearly took a gamble. But to spread his odds he also acquired another draft pick that turned out to be Michael Paliotta, which was a smart move. Paliotta is a few years away from getting a chance in the NHL, but still possesses good potential and his tool set could be a good fit for the Blackhawks blue line at some point down the line. Realistically, any contributions Paliotta can make is just an added bonus to a trade that will eventually be looked at as the deal that brought Brandon Saad to Chicago. I will admit, his repertoire isn’t overly impressive when it comes down to his ability to find premier talent through trades. Dale Tallon was the mastermind who brought Patrick Sharp, Kris Versteeg, and Martin Havlat to Chicago for mere peanuts. This list can’t compare with that type of trade acumen, yet, but the potential is there with Nick Leddy, Brandon Saad, and Viktor Stalberg. However, giving Stan the benefit of the doubt, he has had very little to work with in terms of cap space after the Blackhawks won the Stanley Cup in 2010, which made his job much more difficult. He has done a good job in securing the core players of the team while giving himself enough cap relief in order to add quality depth players to keep the team in contention. Overall the team is doing well under his guidance, especially after their hot start to the 2013 season, but if there is another first round playoff exit at the end of the line, one has to wonder if there will be a shake-up in order.